Ferguson Mayor: Police Will Recruit More Minorities : The Two-Way James Knowles announced several initiatives to calm tensions in the city, including a scholarship program to put more African-American officers on the streets. A man is arrested by police after kneeling in the street during a protest outside the Ferguson Police Department on Saturday. The mayor of Ferguson, Mo., says he plans to launch a number of initiatives to calm tensions in the the city in the wake of the fatal police shooting of 18-year-old Michael Brown. James Knowles, speaking at a news conference today, said the city was creating a civilian review board that would provide input on police affairs. He also said the city would begin a scholarship program to recruit more black officers in the town where African-Americans make up more than half the population but only a handful of the police force. The aim of the program, Knowles said, is to create a police force that is "more reflective of the demographics of Ferguson." He added that the city wants to be "proactive with the next academy class" because it would take time to get new minority recruits trained and on the streets. Knowles said Ferguson would also increase a stipend to officers living in the city from $100 to $300 a month. Earlier, Neil Bruntrager, an attorney for Darren Wilson, the officer who shot and killed Brown and whose resignation from the force became public yesterday, told The Associated Press that his client had decided to resign because "the information we had was that there would be actions targeting the Ferguson (police) department or buildings in Ferguson related to the police department." But although Police Chief Thomas Jackson acknowledged that threats had been made, Knowles said he was unaware of any specific threat leading to Wilson's decision to step down. Knowles said he had not asked for Wilson's resignation and that there had been "no severance agreement" involved. "I think it's best that at this time we continue to move on as a community," the mayor told reporters. Jackson said that he had no intention himself of resigning. The news conference today follows a night in which a few hundred people protested in Ferguson over a grand jury's decision last week not to indict Wilson over the killing. The St. Louis Post Dispatch says that "outside the Ferguson police department, about 150 to 200 protesters gathered to chant and wave signs and flags. 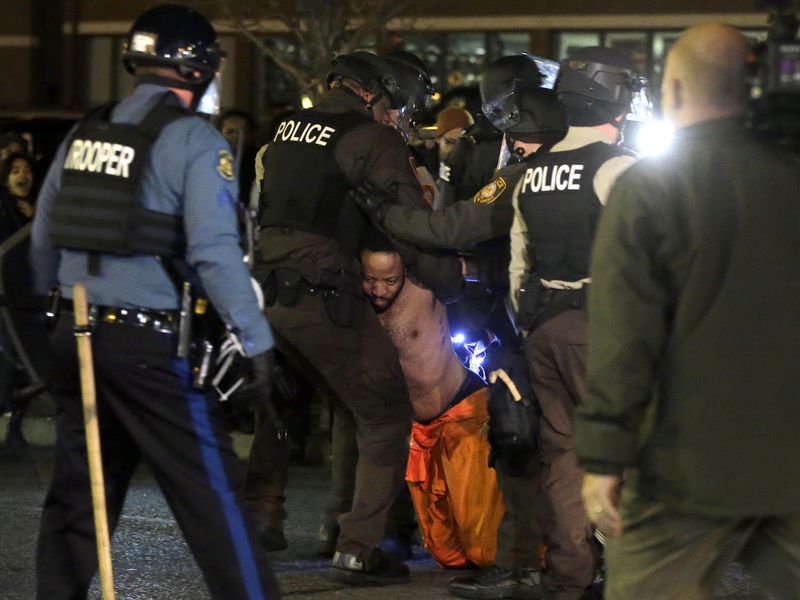 At about 8:45 p.m., they marched South on South Florissant Road." The newspaper says one arrest was made after a man threw a bottle at police. St. Louis Public Radio live blogged the evening's marches and protests here. In Portland, Ore., police made 10 arrests in a demonstration related to events in Ferguson. As we reported on Saturday, in his resignation letter, Wilson said his quitting the force "will allow the community to heal. "It was my hope to continue in police work, but the safety of other police officers and the community are of paramount importance to me," he wrote. Wilson had been on administrative leave since the Aug. 9 shooting.